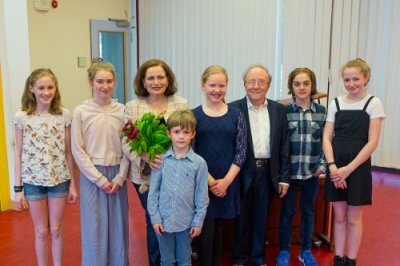 Am 8.5.2018 hat die Senatsverwaltung für Bildung, Jugend und Familie drei Berliner Schulen mit dem Siegel Exzellente digitale Schule ausgezeichnet: die Primo-Levi-Schule, die Georg-Klingenberg-Schule und die Nelson-Mandela-Schule. Bei diesem neuen Siegel geht es ganz zentral um die didaktischen Konzepte, die im Unterricht Verwendung finden, sowie um die Art der Einarbeitung der Verwendung digitaler Medien in die internen Curricula. Ebenso wurde das schulinterne Curriculum Medienbildung sowie der IT- und Medienentwicklungsplan bei der Bewertung berücksichtigt. Warum bekam die NMS ein Siegel? Es geht also nicht um IT-Equipment! Aber natürlich ist klar, dass die besten Konzepte und kompetentesten Lehrkräfte auf vorhandene und funktionierende IT-Ausstattung angweisen sind. Zentral wichtig ist der Förderverein der NMS, der neben der Anschaffung und Reparatur von Geräten seit vielen Jahren eine IT-Fachkraft finanziert, die dafür sorgt, dass an den drei Schulstandorten das, was mit den begrenzten Mitteln möglich ist, auch funktioniert. Auch die Bibliotheken unserer Schule wären ohne Mitarbeiter (ebenfalls vom Förderverein finanziert) keine Lernorte, weder digital noch analog. Und ohne die finanziellen Beiträge der Eltern direkt für diese Zwecke oder bei den Fundraising-Veranstaltungen wäre dies alles nicht möglich! The last concert with music by Hans Leo Hassler and other composers of the 16th century took place at the Passionskirche in November 2017. Our next big project is the opera „Dido and Aeneas“ by Henry Purcell - to be performed in Spring of 2019, conducted by Ulrich Paetzholdt. When visiting the Irving Penn exhibition in her leisure time, Ruby Richter, year 9 student, had a sudden inspiration to take a portrait photo of her grandmother. She shared her independent project with me and I asked her to present her idea to the school community. 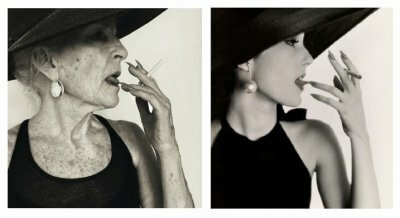 The photograph I took of my grandmother is inspired by Irving Penn’s work “Girl with tobacco on her tongue”, originally from 1951. I call mine “Girl with tobacco on her tongue 50 years later”. Irving Penn is a very inspiring photographer and I find his work highly impressive. Recreating one of his works was quite tricky because it was vey easy to miss little details, like the position of the fingers or the angle of the head but all in all I think my grandma and I did a pretty good job. From February 26th until March 19th 2018 I collected and donated clothes to a shelter named ‘Bahnhofsmission’, located under the station Zoologischer Garten. This shelter helps out the homeless and the less-fortunate by providing food, clothes, and shelter; organized primarily by the people of Berlin. 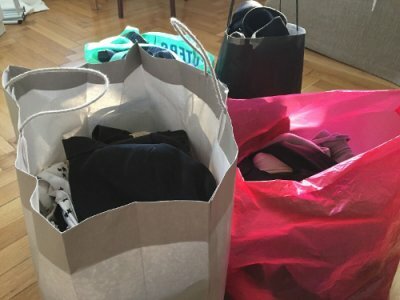 Over the course of 4 weeks I went collected clothes, that came mostly from my myself and my family, as we have lots of clothes laying around that are too small or do not wear anymore. 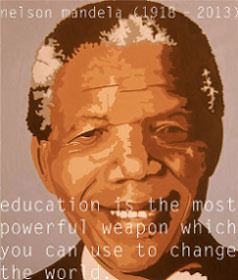 Otherwise I also collected clothes from classmates from our school, and the Nelson Mandela community as a whole. 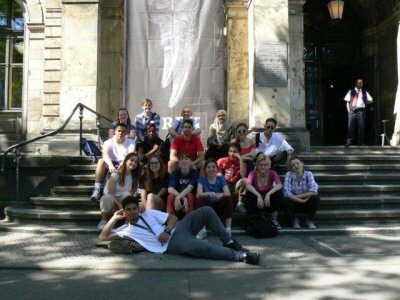 On the 8th of May the IB12 Biology group went looking at key examples of evolutionary evidence including the primeval bird Archaeopteryx, the six-toed panda and other novelties of the pentadactyl limb. All this, plus the primeval horse Eurohippus! Evolutionary processes and mechanisms such as selection, adaptation, convergence and homology were explained and discussed with our guides Victor and Tom. The Nelson Mandela School has once again come together to create and celebrate another successful Ubuntu week (23-27 April 2018). 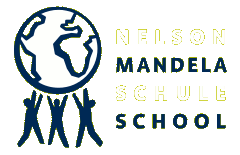 While participating in several activities for the environment, discussing current topics and decorating the different campuses, the students of the Nelson Mandela School have rediscovered the meaning of Ubuntu.This South African word represents the idea that humans are all in constant communication and communion with others and their environment. 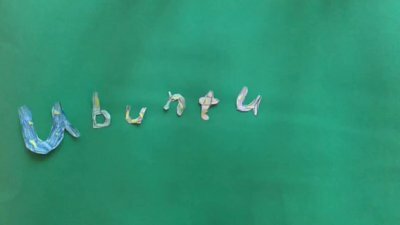 Ubuntu teaches us to be connected, improve the community and have a mutual caring for everyone around us. The idea of the garden project came to me as I first started working at NMS a year ago, back in May of 2017. Now a year later with a lot of hard work and the help of several colleagues and students we finally have our own vegetable garden. The project is supposed to continue. 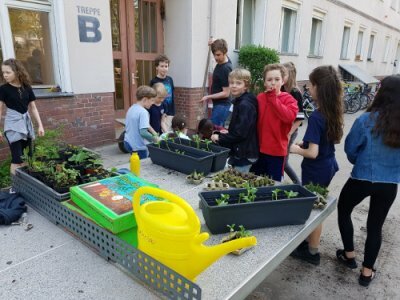 I have planned for it to grow even larger and eventually include all the children of the Primary at Pfalzburger Str. 23 and hopefully the entire community of NMS. That’s exactly what’s happening! I now have the whole community talking to me from all three campuses. Asking me how they can be involved and if they can help in any way and I think that’s fantastic! If there is only one thing that this garden does, and that’s to get the communty talking across to each other, then I think that’s great! As I believe at this point in time at NMS there is nothing more crucial to the progression of our school than communication! Starting in January, I collected clothes over a course of three weeks for my IB CAS project. Many clothes came from my own family including, siblings, cousins, parents, etc., however I had also asked friends and people from Nelson Mandela School to participate and donate clothes.Over the time period of the CAS project many different individuals were willing and able to donate some clothes, including jackets, t-shirts and trousers. 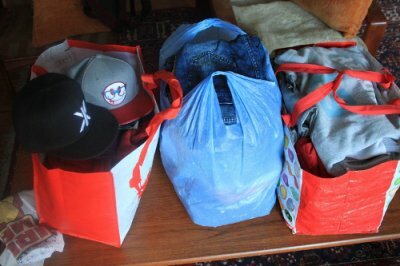 The difficult part was collecting mainly new clothes and if not new, clothes in very good condition to be donated. The reason being that these clothes would then ultimately be donated to a refugee home.